I'm a huge fan of Ed Grimley. If you haven't seen it, you have to check out the Ed Grimley skit from SCTV that guest starred John Melencamp. Great stuff. I loved the saturday morning cartoon as well. Got to see Martin Short live a few years ago and loved it. Seeing Ed Grimley (as well as Jiminy Glick) in person was awesome. Yeah, I remember this character! 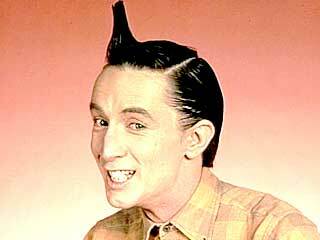 I wonder where Martin Short got the idea for Ed Grimley? That was such a funny sketch. I forgot all those goofy mannerisms! To comment on your post, I do remember those bits. very funny. I was too little to stay up late for Ed Grimley on SNL but I LOVED the cartoon when it was on. I remember it being a short run, I must say! Who played Ed Grimleys dad in Thanksgiving skit?